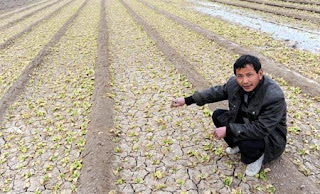 China View reports that droughts put north China on red alert. BEIJING, Feb.2 (Xinhua) -- "The wheat grass gets so dry that it catches fire! I've never seen this in my whole life," said 50-year-old Wei Liuding in Baisha village, Muzhong County of North China's Henan Province. Wang Hongwei, a farmer from Putaojia Village of Henan's Lankao County, grievingly held a grasp of wheat grass roots in his hand. 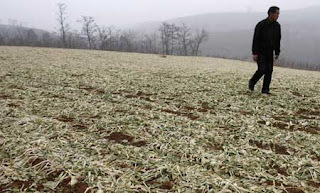 "All the wheat in my land is dying like this," he told a Xinhua reporter. 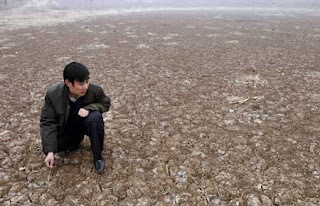 Henan, China's major grain producer, issued a red alert for drought Thursday. The provincial meteorological bureau said the drought is the worst since 1951. The drought have affected about 63 percent of the province's 78.9 million mu (5.26 million hectares) of wheat. But Henan Province is not the only victim in thirsty northern China. Anhui Province issued a red drought alert Sunday, forecasting a major drought that will plague more than 60 percent of the crops north of the Huaihe River if no rain is reported by next week. Shanxi Province was put on orange drought alert on Jan. 21, as nearly one million people and 160,000 heads of livestock are facing water shortage. Provinces such as Shaanxi, Shandong, Hebei and Jiangsu are also reeling from droughts. According to the Office of State Flood Control and Drought Relief Headquarters on Sunday, the droughts in northern China have affected about 145 million mu (9.67 million hectares) of crops, and have left 3.7 million people and 1.85 million livestock with poor access to drinking water. Secretary of the office E Jingping said the headquarters sent four working teams to eight provinces to supervise the drought relief work. The Ministry of Finance (MOF) has allocated 100 million yuan (14.6 million U.S. dollars) in emergency funding to help ease the drought. E said about 1.38 billion yuan had been used to fund the relief work since the end of December. Some 74.60 million mu (4.97million hectares) of farmland have been irrigated, and drinking water shortages have been eased for about 500,000 people and 280,000 livestock. The irrigation system in the drought area is under a crucial test. The water flow under Xiaolangdi Dam on the Yellow River reached 550 cubic meters per second as of 2 p.m. Saturday, to help soothe the drought in Henan Province. "The water in my well is very deep today," Wei Liuding told Xinhua reporter Sunday. "Although we were informed that the government's subsidies will be soon handed out to households, I decided not to merely rely on the government, and I am now irrigating the lands for four hours a day at my own expense." But with a family of five, Wang Hongwei was more worried. "Though we irrigate the lands now, the production will surely see a big drop. Like many other people in our village, I am thinking about doing odd jobs in the town to earn some extra cash." China Daily reports that Henan warns against severe droughts. China's largest crop producing province Henan Thursday issued the highest-level warning against continuing droughts in the coming week, the province's first such warning since June of 2007 when the warning system was established. The provincial meteorological bureau of Henan said the province had received an average rainfall of 10.5 millimeters since November 2008, almost 80 percent less than in the same period of previous years. The central Henan Province has a population of nearly 100 million, the largest in China. It has been the largest crop producing province for eight years. The draught has affected about 63 percent of the province's growing wheat and is likely to expand for the next week, the provincial meteorological bureau said. Here is another picture from China Daily (drought relief effort under way). Weather forecasts predict that rainfall will remain low this month. My reaction: Wow, this is a disaster. Double digit food inflation in China (and the world) is guaranteed. This story should wipe away any deflation fears. 1) China's largest crop producing province, Henan, has issued the highest-level warning against continuing droughts in the coming week. 2) Henan has received an average rainfall of 10.5 millimeters since November 2008, almost 80 percent less than in the same period of previous years (and it experience a drought last year too). 3) Henan Province has a population of nearly 100 million, the largest in China and has been the largest crop producing province for eight years. 5) The Henan drought, which began in November, is the most severe since 1951. A) Anhui Province issued a red drought alert Sunday, forecasting a major drought that will plague more than 60 percent of the crops north of the Huaihe River if no rain is reported by next week. B) Shanxi Province was put on orange drought alert on Jan. 21, as nearly one million people and 160,000 heads of livestock are facing water shortage. C) Provinces such as Shaanxi, Shandong, Hebei and Jiangsu are also reeling from droughts. 7) Relief efforts are under way, but there is a limit to what can be done in the face of such widespread water shortage. 8) Weather forecasts predict that rainfall will remain low this month. Conclusion: China is facing hyperinflation, and world food prices are rising fast. This drought in Northern China will make things worse. Food inflation in China is guaranteed to reach the double digits in a month or two if the drought persists. The Chinese government will then be under enormous pressure to drop its dollar peg. Thanks. Recommend RJA and DBA. This is a Don Coxe page 16 story for now, then may well become the Page 1 story.